We bought extra uniform shirts to hand to out-of-town visiting NSOs and any last-minute volunteers who don't have uniform shirts. Keeps everyone dressed the same, no matter where they're from. We're taking a different approach this weekend and doing a 'beach party' theme, as our venue is a molten hell of zero AC and our uniform shirts are polyester. I was announcing at a Tournament in Aberdeen when a guy strolled in wearing a Newcastle shirt and at first I assumed it was an off duty ref. that's why I don't like refs wearing newcastle or juventus football jerseys instead of an American ref shirt with narrow stripes..
What about penalty trackers? I'm kind of liking the idea of having each tracker wearing the colour of the team they are tracking penalties for, so its easy to see at a glance which one you need to relay a given penalty to. Interested to hear thoughts on it, especially from anyone who sees major problems with it. I dislike anyone in an official capacity wearing clothing that matches either team's colors. I'm fine with indicators, like wristbands or the like. Also, if done correctly, it shouldn't matter which penalty tracker you drop penalties off to. Man, I love using a single penalty tracker. Man, I love using a single penalty tracker. It's a team thing. It's not you doing it alone. Anyway, I shouldn't have derailed the thread. I'm with Major Wood on this. I like my people in neutral clothing... if they're wearing team colors, people could suspect bias. Also, it wouldn't work for scorekeepers if they follow their jammer ref in the team switch after halftime. Team colors - Black and White, with a tiny touch of red on the heart in the logo. for sale the Logo is always printed in white on a black shirt. 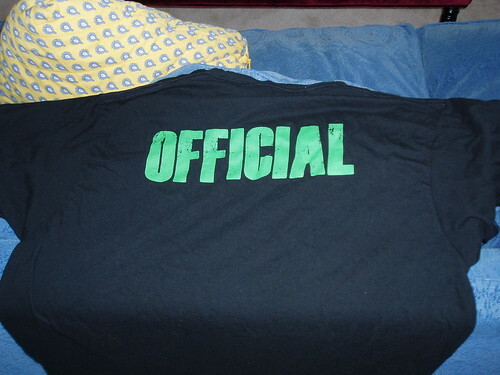 NSO/Staff shirts are RED with the team logo on the front, done in reverse coloring, we have a black heart. On the back STAFF is printed in giant white letters. you can buy it if you want it, or just borrow one for the night. Not much red gets worn to our bouts, so I can pick you out of the crowd quickly when I need you. It's bad form for the NSO's to have Team Logo's on their shirts, just as its bad form for a Referee to have the League/Team Logo on his Stripes. During the bout the NSO's and Referee's are Team 3. The Impartial and Unbiased team. Sometimes you can't help it when your grabbing non-skating members at the last minute to fill NSO slots, but we try and tell our skaters to make sure to bring a plain black ( or other Non-Affiliated) shirt with them in case they are needed. Interesting enough, at lastnights Panama City game 1/2 the NSO crew was from a team not competing in the bout so the Leage T-Shirts were worn since they weren't for either team playing. That was at my request. Finding the NSO's was made much easier. They have a few other positions that weren't NSOs but they got the yellow shirts too. One of them was the track safety officer. When needed, I could pick that person out of the crowd in a heart beat if needed. This was especially important because that person was constantly in motion working around the track.